A safety deposit box is the best place to put or store all your valuables in if you keep them at home. Whatever type of valuable possessions you have: money, jewelry, paintings and other priceless art pieces, and other important personal documents, with the right security safe, you will have a storage area you can use to keep them all safe from theft and possible damage. 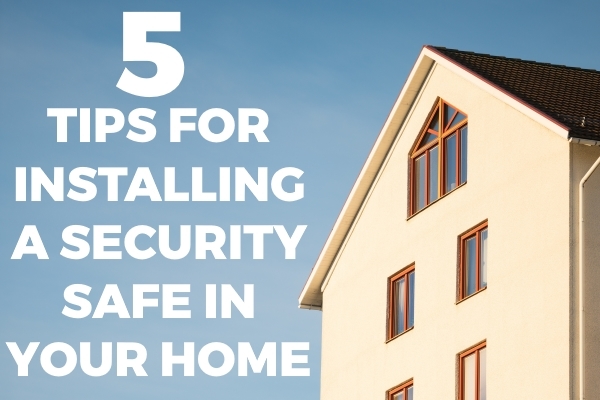 To help you narrow down your list of places in your home to install a security safe, start by crossing out the garage. This is the worst place to keep your safe in. This is because this place is at a high risk for burglary, fire, flooding, and humidity. When you open your garage door, strangers can easily see that you have a safe. Fire can also start in this area because of improperly stocked fuel and other highly flammable chemicals. Temperatures can also easily fluctuate in your garage and, as such, humidity can affect this storage fixture. Your safe should be in a place that is not easily seen by strangers or even guests. After all, you don’t want this feature to catch any attention as it is intended to protect your valuable possessions, away from prying eyes. However, make sure you will have easy access to your safety as well. You don’t want to be in a constant struggle with this feature just to place another item or get something out of it. The most suitable place to install your safe is somewhere it will be out of sight, in an area far from your general or frequented floor space such as in a cupboard or under a desk in your home office. Generally, it is better to install a safe box on a concrete floor than to a wooden floor. This is because security boxes come with installation kits designed to work with concrete floors. As such, the safe will be easier to fasten and you won’t need to buy additional items. In addition, concrete floors are also more secure and will make it harder for burglars to remove your safe and take it with them. If you have no choice but to fasten the safety box onto a wooden floor, you will need to get some coach bolts, gripfill adhesive, specialized glue, and other tools and materials for installation. Before you begin drilling into your floor, inspect the area underneath for any existing pipework. If you damage any pipes, you can cause a lot of damage to your home which will be expensive to repair. In case you want to place the safe in an area which you discover is housing underfloor heating, cross out this place and look for another one. Keep in mind that damage caused to your utilities will just lead to a lot of headaches and expenses. As such, before starting the installation work, double-check the floor and everything that’s under it. Although your security deposit box comes with an instruction manual and the installation kit, and you can always go online to find additional tips and recommended steps, you may still have a hard time with the whole process. After all, you will have to drill through the floor or wall and carry a heavy safe. If you’re not confident of doing all these things, call a carpenter to help you out. You can also ask the supplier or manufacturer to recommend a contractor that can install the safe for you. A safety deposit box is a storage feature you need to have if you want your treasured possessions near you but secure. It will keep your valuables protected at all times whether you’re in or out of your home. Just be sure to place it somewhere hidden, stable and accessible to you. AUTHOR BIO: Jay Flavell is the General Manager at Sandleford Holdings. He has been working in the DIY & Home Improvement industry since 2007 and has vast experience sourcing and developing products from overseas suppliers in the Far East. Jay has also been successfully dealing with a number of major DIY & Home Improvement retailers throughout his career.